This past Monday at Hearst's yearly company-wide sales meeting, Hearst Magazines president, marketing and publishing director Michael Clinton announced the winners of the Tower Awards, which are given annually to the company's best-performing titles. This year, the honorees included Good Housekeeping, Town & Country, Elle Décor, HGTV Magazine and Harper's Bazaar. When judging the awards, first founded over a decade ago, Clinton said he takes into consideration more than a dozen factors, including ad revenue, rate per page, operating income and P&L growth. "We also look at it holistically," he added. "It's about great management, innovation and reinvention." Reinvention earned Good Housekeeping a Tower Award despite the dismal state of the women's service category. "This sector was challenged this year in general, but Good Housekeeping had a terrific year this year in terms of their business," said Clinton. Despite ending 2014 with ad pages flat, the recently revamped brand saw double-digit increases in its bottom line and profit, while its website was one of Hearst's most profitable sites this year. 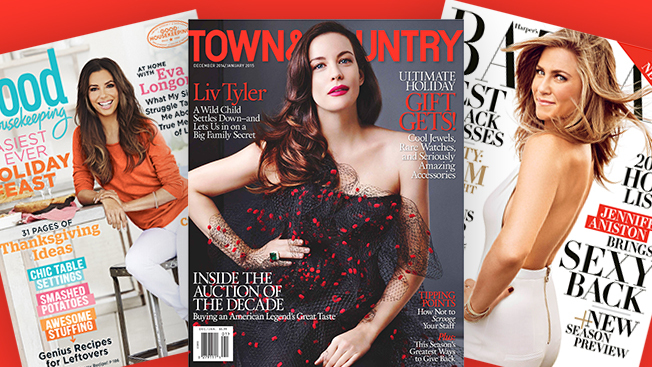 The once-stodgy Town & Country, which won its second Tower Award in two years, was another brand whose editorial revival has resulted in growth on the business side, including a double-digit increase in profit for 2014. "It all sort of came together—the editorial product, the advertising side, the brand's first philanthropy conference, the relaunch of [Town & Country] Travel," explained Clinton. The magazine's publisher, Jennifer Bruno, was also awarded with a promotion to vp. Elle Décor, which marked its 25th anniversary this year, had its best year ever in terms of print advertising. Clinton attributed the brand's growth to its diversified advertising base, which has attracted numerous fashion and luxury brands in addition to the endemic shelter advertisers. Hearst's newest home design title, HGTV Magazine, won its first Tower Award after posting the largest raw increase in revenue within the company due to dramatic circulation growth. It is now in the top third of Hearst's most profitable titles. Finally, Harper's Bazaar continued on its massive growth streak under publisher Carol Smith, winning a Tower Award for the third year in a row. The magazine published its largest-ever March and September issues in 2014, while Bazaar.com had a record-breaking traffic month in October with 5.6 million unique visitors.